A rising Millennium boys volleyball team came of age April 3 on the road against the veteran Deer Valley crew. The teams traded periods of dominance in the opening two sets. But the Tigers, with only one senior in their rotation, closed out the final two edge-of-the-seat games to win 25-16, 18-25, 25-22, 27-25. Millennium (21-3 overall, 10-1 regular season) coach Shawn Brannick said this victory was a breakthrough, given the tight nature of the match and the quality of the opponent. “We’ve had a couple games against better teams this year where we’ve gone down late in the 20s. They showed no worry or question tonight. They came into the huddle really loose and you could tell that they meant business,” Brannick said. Millennium moves up to the No. 7 ranking in 5A with the win. Meanwhile Deer Valley (13-8, 8-3) stayed at No. 8. The Skyhawks have been where the Tigers are now. Juniors fueled Deer Valley to the top seed in 2018. After falling to American Leadership Academy-Queen Creek in the semifinals last season, this now senior-dominated group is not a breakout contender any more. They’re more focused on the end result. Junior outside hitter Austin McKee helped the visitors pull away with five first-set kills. 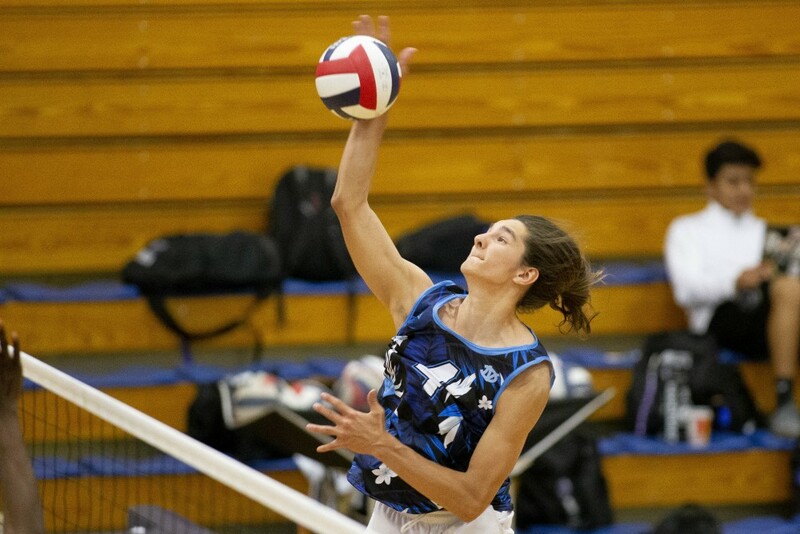 Deer Valley stormed back in the second, fueled by senior outside hitter Nathan Chapparo’s six kills, ace and block. Senior Ben Nyguen added a pair of aces. Now the Skyhawks seemed in control, bursting to a 10-4 to begin the third. Three straight hitting errors got Millennium back in the game. McKee tallied five kills and the Tigers eventually pulled away for a 24-19 lead. Deer Valley fended off three set point but McKee slammed the door, emphatically. “We didn’t pass very well. We’re a really good passing team against tough jump servers but we really need to up our game against tough floaters and these guys have a bunch of tough floaters. When you don’t pass really well, your offense is out of sync,” Ulrich-Suss said. That was merely the prelude for the high-wire fourth set. Neither team led by more than three points and neither coached called a time out until Millennium did after Deer Valley scored two straight points and seized a 21-20 lead. Chapparo added a back row kill but the Tigers tied it at 22 and forced a Skyhawks time out. Senior middle blocker Nathan Schrade’d kill put the home team a point away. Again, Millennium kept its poise, as kills by McKee and junior Oskar Kozieja regained a 25-24 lead. Chapparo tied it with his 12th kill of the night. The Tiger’s lone senior starter, outside hitter Adam Smith, slammed one down for the lead. Then Kozieja finished the match with a block. “This was a tense game but all the boys played together really well, with great passes and good communication. It’s a very big win, especially with us working together as a unit. Our setters’ passes were there. I couldn’t say more,” McKee said. This was the Skyhawks first loss since they over-prepared in California. Deer Valley went 1-4 in the La Jolla Beach Cities Invitational March 15-16 but three of those teams were in the MaxPreps national top 100. As the two teams’ Arizona rankings suggest, 5A will be a dogfight. Thus far no clear favorite has emerged – but results suggest the eventual 16-team 5A playoff field will not have an easy touch either.